This is my second attempt at an early Tudor woman's head covering, but I still feel that the work pictured here is far from being an accurate recreation of the hoods worn by women between 1495 and 1503. Although I have perused the literature and learned 20th century names for this hat, I cannot find any reference to what ladies of the day might have called it. Modern authors have called it a kennel headdress or dog-kennel headdress, or a gable hood because of the gable-like shape of the front, and the fact that it evolved from the medieval hood with a liripipe, and although some have ridiculed it, few have ventured to speculate about the methods of its construction. There are no extant hats of this type, but wires bent in the "gabled" shape that frames the face have been excavated in London . I have researched memorial brasses of the time period ,, , ,  (see also Monumental Brass Society) because they are, with the exception of a small number of portraits of the queen Elizabeth of York and some fineray sculptures (see www.tudoreffigies.co.uk for examples), the only natively produced visual source for English women's costume during the reign of Henry VII. The illuminated works with which I am familiar were produced on the continent, and this style of hat never seems to have been adopted there. 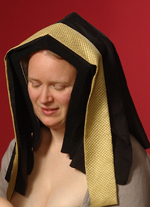 I am still refining my mental image of the acceptable and normal variation in the hoods or hats worn by English women at the turn of the 16th century; constructing and wearing this hood was a part of this process. For this hood I started with the pattern produced by the authors of The Tudor Tailor. 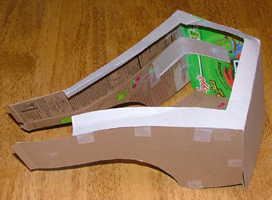 I then altered my cardboard mock-up (right) to change the angle of the back of the hood, based on my concept of the desired profile. Their pattern seemed too sharply angled, so I lowered the peak of the undercap back. Otherwise, I followed their pattern and assembly instructions. In my opinion the hat has the basics of the right look, but cannot be quite right, as it is too difficult to wear and does not sit properly throughout hours of use. I used the only buckram I found at the local fabric store, but it is lightweight and inadequate to the supportive task asked of it in this hat. Perhaps four or more layers (I used two) would achieve the desired result, or perhaps a different brand or weight of buckram might be purchased. I may also need to use a thicker wire. The pattern authors suggest that the buckram and wire be covered with domet or lightweight flannelette or wincyette. I used some scraps of medium-weight wool. Although I intended to cover the undercap with an additional layer of fashion fabric (linen and silk are both recommended), after constructing the cap I felt that it was not wearable enough to warrant this extra effort and expense. The photos below show the front of the cap while I was stitching the supportive wire between the two layers of buckram, and the wool basted onto the buckram, ready for the linen lining. Each piece was finished thus before being sewn together into a three-dimensional hat. The veil here is light silk finished with a rolled hem. The images I have seen suggest that the veil should be heavier and have a more substantial drape; I want to make both cap and veil out of silk velvet, as contemporary accounts reference hoods made of velvet . However, I was constructing this for wear at Pennsic and velvet would have been terribly hot. Also, as I said, I was dissatisfied with the hat before I finished it, and did not want to commit a costly fabric to its construction when I had inexpensive lighter silk available. I am glad that I did not cut my velvet, for I find the veil pattern to be simplistic. 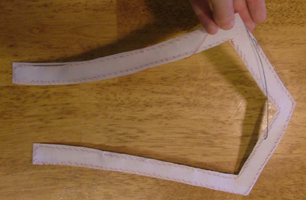 It is a semi-circle, which looks nice flat but does not produce an even hem when draped over the rigid undercap. In the future I will cut the veil slightly longer in back, or more ovoid in shape when spread flat. The lappets are also a shortcut, as I found silk with a woven geometric design that evokes the patterning depicted in memorial brasses and effigies. I believe that the actual lappets would have been adorned with embroidery and jewels. When I have a hat worthy of such effort, I will endeavor to embellish it so. I attempted to use the best sewing methods I could when making this hat. It is entirely hand sewn using backstitch, running stitch, slip stitch, and rolled hem stitches. The bits of pink silk thread that peeks through the top of the gable front are testament to my original intention, that the wool be covered with a finer fashion fabric. I have long hair that falls below my waist, so experimenting with hats always also involves learning how best to arrange my hair. In the simple line-drawings of the memorial brasses, the hair of the married women is completely obscured by their hats. In the portrait of the queen Elizabeth of York (right) one can see that her hair is parted down the center and that some bundle of it crosses her head just behind the natural hairline. 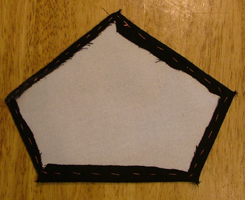 I have found that dividing my hair into two hanks, crossing them over my head just beyond the hairline, and sewing the hanks onto the hair underneath with twill tape works well. Because I cannot detect much evidence of visible tape in the funerary art, I have also experimented with crossing two braids over the front of my head, then securing them to each other at the nape of my neck. This holds fairly well for many hours of wear. This hat requires hair arranging that brings the hair off the back of the head, as there is no room in the rear of the stiffened cap for even the smallest coil of hair. I find that the undercap front (the little one-inch "lip" that frames the face) catches on the roll or braid of hair, keeping the hood from slipping back off the head. However, many brasses depict women wearing hoods that lack this front piece, so it must not be required to hold the hat on the head. Unmarried daughters are often depicted on memorial brasses wearing what seems to be just the front few inches of the stiffened undercap without the box on the rear, the veil, or perhaps even the lappet. Somehow this slim portion of the hat must be made to stay on the head even with the hair down and flowing. My current design certainly could not be reduced to just the front few inches; it would fall off as soon as one moved. The greatest impediment to the wearing of this hood is that when I tilt my head down the least bit, the stiffened front brushes against my collarbone, lifting the entire hat off my head. I am endowed with a long neck; my shape is not the problem. 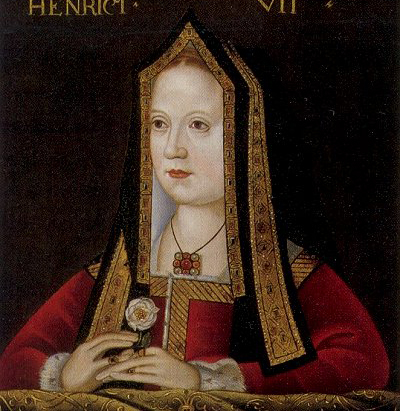 Studying the portrait of Elizabeth of York, it appears that everything is stiff and lies perfectly far down over her chest. 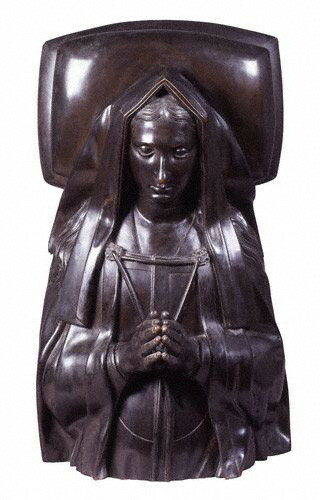 However, in her funeral effigy (right), the stiffened portion appears to end at her shoulders, and only the flexible veil rests against her body. In the portrait, the sides of the hood are at a 90 degree angle to the front along the gable-shaped top of the hat, but when they extend down into the longer portions, the sides of the hat bend outward and lie flat against her body. Perhaps it is stylization that makes them appear so rigid, and they are actually more flexible than the reconstructed hat I have made? I learned a good deal about constructing hats from the process I undertook with this one, but I know I must spend more time studying images, more time searching for articles, and more time constructing cardboard mock-ups before I attempt my third gable hood. 1. Melanie Schuessler, "French Hoods: Development of the Sixteenth-Century Court Fashion," in Robin Netherton and Gale R. Owen-Crocker, eds. Medieval Clothing and Textiles Volume 5 (Woodbridge: Boydell Press, 2009),133. 2. Ninya Mikhaila and Jane Malcolm-Davies, The Tudor Tailor: Reconstructing sixteen-century dress (Singapore: B T Batsford, 2006) 28. 3. Henry H. Trivick, The craft and design of monumental brasses (London, J. Baker; New York, Humanities P., 1969). 4. Malcolm Norris, Monumental Brasses: The Craft (London & Boston: Faber and Faber, 1978). 5. Muriel Clayton, Catalogue of Rubbings of Brasses and Incised Slabs (London, Her Majesty's Stationery Office: Victoria and Albert Museum, 1968). 6. M.W. Norris, ed. Monumental brasses: the portfolio plates of the Monumental Brass Society, 1894-1984 (Woodbridge, Suffolk [England];Wolfeboro, N.H., USA : Boydell Press, 1988). 7. Edward Kite, The monumental brasses of Wiltshire: a series of examples of these memorials, ranging from the thirteenth to the seventeenth centuries, accompanied with notices descriptive of ancient costume, and generally illustrative of the history of the country during this period (Bath, Somerset, Kingsmead Bookshop, 1969). Facsimile edition. First published 1860.